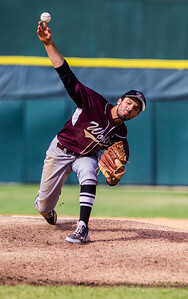 Kyle Grillot - kgrillot@shawmedia.com Prairie Ridge's Benjamin Cilano pitches against South Elgin during the first inning of the 3rd place state final Saturday, June 13, 2014 in Joliet. 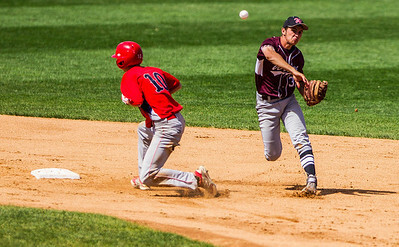 Kyle Grillot - kgrillot@shawmedia.com Prairie Ridge's Nick Schmidt (right) tags out South Elgin's Dan Asa during the first inning of the 3rd place state final Saturday, June 13, 2014 in Joliet. 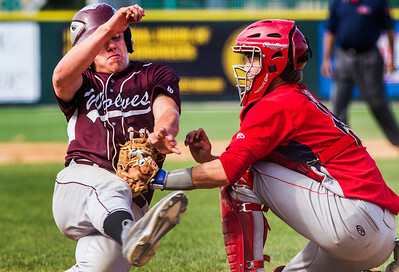 Kyle Grillot - kgrillot@shawmedia.com Prairie Rigde's Austin Covers attempts to tag out South Elgin's Nick Menken during the first inning of the 3rd place state final Saturday, June 13, 2014 in Joliet. 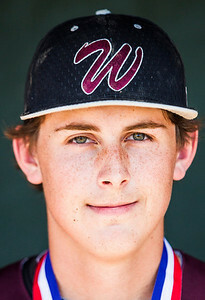 Kyle Grillot - kgrillot@shawmedia.com Austin Covers after the 3rd place state final against South Elgin Saturday, June 13, 2014 in Joliet. 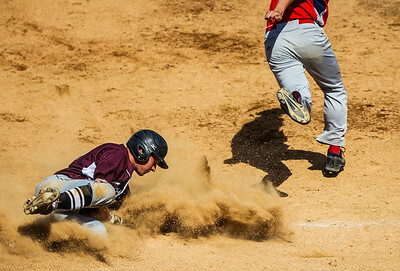 Kyle Grillot - kgrillot@shawmedia.com Prairie Ridge's Nick Schmidt slides safely to third base during the second inning of the 3rd place state final against South Elgin Saturday, June 13, 2014 in Joliet. 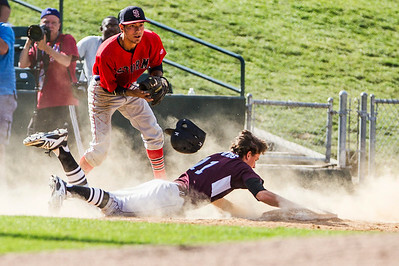 Kyle Grillot - kgrillot@shawmedia.com Prairie Ridge's Nick Schmidt slides safely to second base as South Elgin's Dane Toppel drops the ball during the second inning of the 3rd place state final Saturday, June 13, 2014 in Joliet. 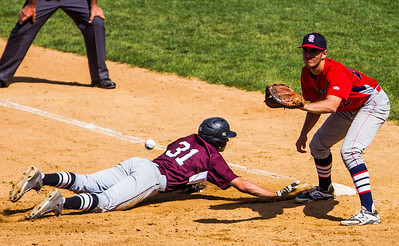 Kyle Grillot - kgrillot@shawmedia.com Prairie Ridge's Nick Schmidt slides safely to first base guarded by South Elgin's Ryan Nutof during the second inning of the 3rd place state final against South Elgin Saturday, June 13, 2014 in Joliet. 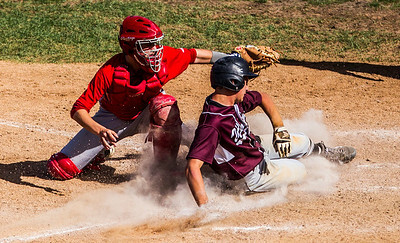 Kyle Grillot - kgrillot@shawmedia.com Prairie Ridge's Alec Thune is tagged out by South Elgin's Nate Brummell as he slides toward home plate during the sixth inning of the 3rd place state final against South Elgin Saturday, June 13, 2014 in Joliet. Kyle Grillot - kgrillot@shawmedia.com South Elgin's Nate Brummell tags out Prairie Ridge's Nick Schmidt as he slides toward home plate during the fifth inning of the 3rd place state final against South Elgin Saturday, June 13, 2014 in Joliet. Kyle Grillot - kgrillot@shawmedia.com Prairie Ridge's Austin Covers' helmet flies off as he is tagged out returning to third base by South Elgin's Dane Toppel during the seventh inning of the 3rd place state final against South Elgin Saturday, June 13, 2014 in Joliet. 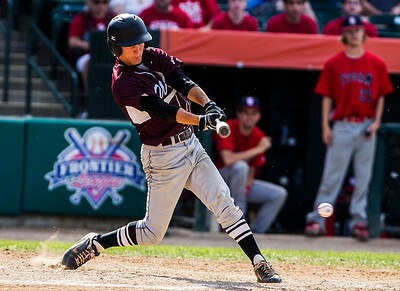 Kyle Grillot - kgrillot@shawmedia.com Prairie Ridge's Kyle Buresch hits a South Elgin pitch with the bases loaded in the the seventh inning of the 3rd place state final against South Elgin Saturday, June 13, 2014 in Joliet. 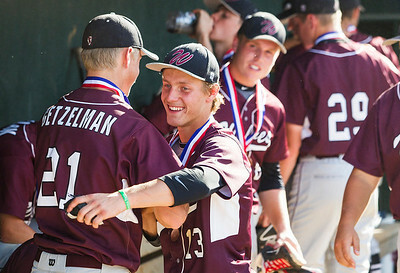 Kyle Grillot - kgrillot@shawmedia.com Prairie Ridge's Kyle Buresch (13) greets Carson Getzlman after losing to South Elgin in the 3rd place state final against South Elgin Saturday, June 13, 2014 in Joliet. 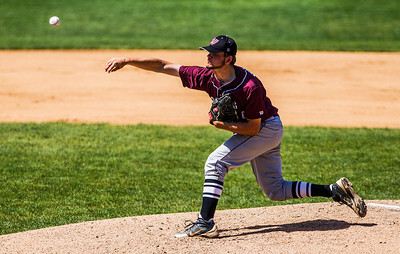 Kyle Grillot - kgrillot@shawmedia.com Prairie Ridge's Jack Meyers pitches against South Elgin during the sicth inning of the 3rd place state final against South Elgin Saturday, June 13, 2014 in Joliet. 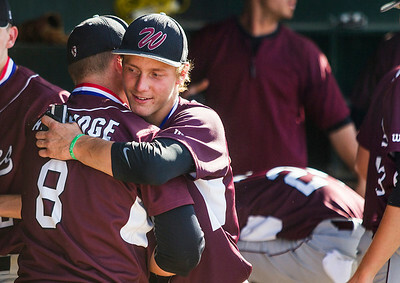 Kyle Grillot - kgrillot@shawmedia.com Prairie Ridge's Tim Jablonsky carries the fourth place trophy after losing to South Elgin in the 3rd place state final against South Elgin Saturday, June 13, 2014 in Joliet. 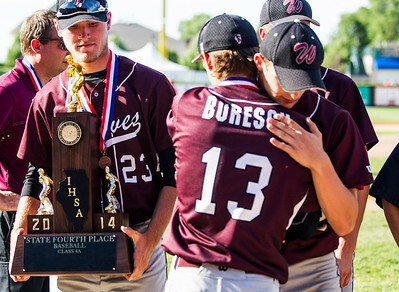 Kyle Grillot - kgrillot@shawmedia.com Prairie Ridge's Tim Jablonsky (left) carries the fourth place trophy after losing to South Elgin in the 3rd place state final against South Elgin Saturday, June 13, 2014 in Joliet. 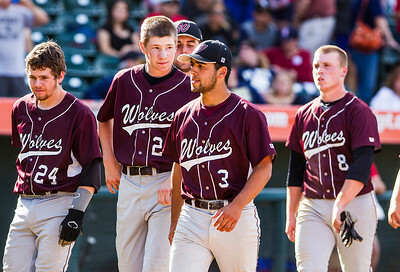 Kyle Grillot - kgrillot@shawmedia.com The Prairie Ridge team including Dustin Thelander (from left) John Tieman, Thomas Keaty, and Caleb Aldridge exit the field after losing to South Elgin in the 3rd place state final against South Elgin Saturday, June 13, 2014 in Joliet. Prairie Ridge's Austin Covers' helmet flies off as he is tagged out returning to third base by South Elgin's Dane Toppel during the seventh inning of the 3rd place state final against South Elgin Saturday, June 13, 2014 in Joliet.